Yesterday was a long one! Work was crazy busy, and before work I ran some sprints and then did Fitness Blender's Tank Top Arms and 8 Minute Abs. I need to use heavier weight next time. I'm not sore today. My oldest left for a week of camp this morning, she is so excited. 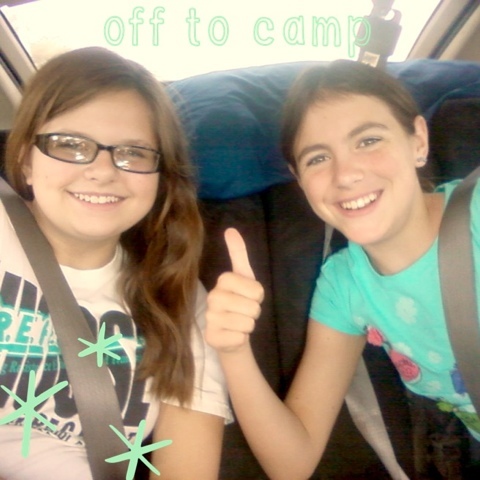 She's been to church camp before, but this is her first time going to 4H camp. I got up and ran a slow 5k on the treadmill this morning and felt good, then we went to brunch, and since I have been dizzy and just feeling off so I'm home having a True Blood catch up marathon. I'm going to drink as much water as possible and watch copious amounts of tv and hope that I feel better in the morning.